The Wm. A. Stewart Endowment was initiated in 1991 by the Agricultural Leadership Trust as a tribute to the late Ontario Minister of Agriculture, William. A. Stewart. The goal was to recognize and honour his legacy of public service, community involvement and leadership. 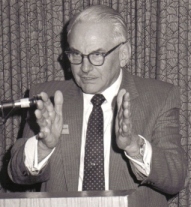 As honourary chairman of the Agricultural Leadership Trust from its inception in 1984 until shortly before his death in 1990, Stewart was an ardent supporter of leadership development for Ontario agriculture. Stewart served as the Ontario Minister of Agriculture from 1961 to 1975. During his tenure he introduced many programs which continue to impact on Ontario agriculture. He had a passion for agriculture and exemplified strong leadership qualities both in public service and community involvement. As part of each AALP class the Wm. A. Stewart Lecture is held every other year. The event is sponsored by the Wm. A. Stewart Endowment and proceeds from the event help support the current class. This prestigious event provides an opportunity for public involvement, as well as a forum for the development of the leadership qualities exemplified by the work of Stewart.